The movie Lucy and how it portrayed the ability to use 100% of our brain was to me an incredible dose of inspiration to seek ways to increase the productivity of my brain. This organ is fascinating, training it to continuous development and committing to excellence is an interesting adventure. Supposedly, we use only 10% of the brain power. What would it be like if we increased its efficiency by only 1%? Miracles would happen. Our brain is designed to learn. Each brain has its neuroplasticity, or ability to adapt and respond to changing conditions. Each new situation, activity and challenge contributes to the development of our brain. As we know, we have two hemispheres, each having a completely different personality. Left – responsible for logic, speech and its understanding, writing, analytical thinking, the ability to recognize objects. 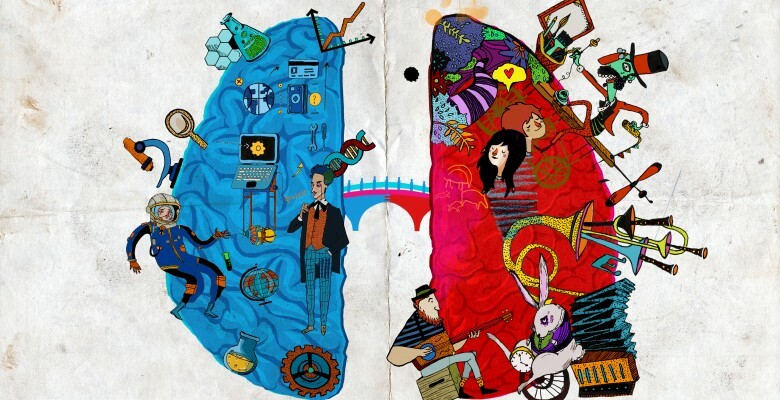 While the right hemisphere is responsible for creativity, creation, artistic abilities, abstract thinking, and intuition. R. E. Ornstein, an American psychologist, goes a step further and calls the right hemisphere the eastern mysticism and the left one, the western rationalism. The left hemisphere is the past and the future. The right is the space here and now. Thinking about the past or the future too much? More frequent visits to the right hemisphere would help us increase the awareness of the moment and enjoyment of the present. We love to pigeonhole people and things, putting them in the drawers. It makes our life easier and is easy to use. Good – bad, introvert – extrovert, creative – analytical, sweet – bitter, etc. Even working in a widely understood marketing defines us through either – or. In marketing, if it is difficult to pigeonhole someone into creative or analytical because they have competences, we also have a pigeonhole for that, called account manager 🙂 Because how can you live without the pigeonholes? The truth is, in the most creative or analytical professions of the world, using only one hemisphere will prevent us from achieving a real mastery. Same with the product brand or personal brand. A brand is one of the pigeonholes in our head, which we define based on our needs. It has a name, it is always one word. Our brain cannot handle more because there are plenty of pigeonholes there. Its name is a kind of mental shortcut which maximally curtails the deciding process about the purchase or relationships. I believe that in order to build a strong brand, we should build it based on solutions coming from the right and the left hemisphere. Through the combination of the logical and analytical world with the world of creativity and art. Not only our left and right hemisphere, but also the corporate world (left hemisphere) with the world of agencies (right hemisphere), or the marketing sector (right hemisphere) with the sales department (left hemisphere), and so on. Seeking knowledge about the brain, I came across the TED Talk by Dr Jill Bolte Taylor. In 1996, she had a stroke and experienced the functioning of only the right hemisphere. She said that upon ‘losing’ the left hemisphere, she could study the brain from the inside, which enabled her to learn more during these couple of minutes than the entire career. I really needed people to take responsibility for the kind of energy they brought me. We encouraged everyone to soften their brow, open their heart, and bring me their love. I think the meaning behind this quote is what we all need most.